One of the things I realized is very handy when prototyping or debugging is to draw a line on a specific location. 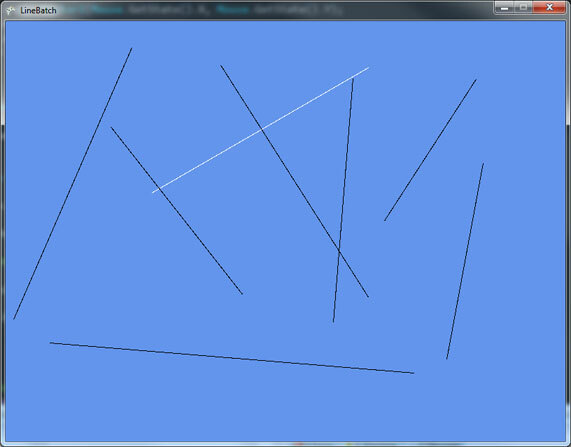 Like drawing lines around collision boxes to see if your character is making a proper collision. For my games I’ve made a small LineBatch. Basically LineBatch uses a SpriteBatch to draw the lines by stretching a 1×1 white Texture2D to your line size. You can give it 2 points ( start and end point of course) and a color. There’s an overload function that receives the Layer parameter. LineBatch is a static class, you only need to call LineBatch::Init(GraphicsDevice) somewhere on your code. I’ve made a small unit test that you can download here. Try clicking the screen to set a start and end point. Wow thats great thanks love your blog. It’s just absurd that they didn’t include basic line drawing functionality. Way to go Microsoft! How would this be converted to use points in 3D space? because TextureUsage doesn’t exist anymore. Thanks, you help me a lot!